Zion National Park is located in southwestern Utah about 2.5 hours from Las Vegas. 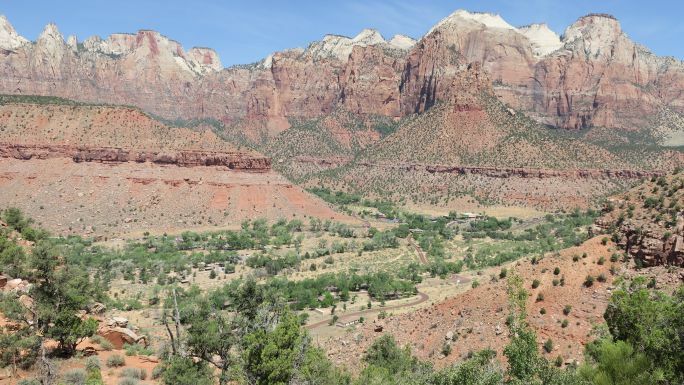 In 2017 Zion National Park had 4.5 million visitors. I tell you this so you know to be prepared for the crowds. We visited Zion in early June on a Sunday and Monday. We found the park to be quite busy on the days of our visit. 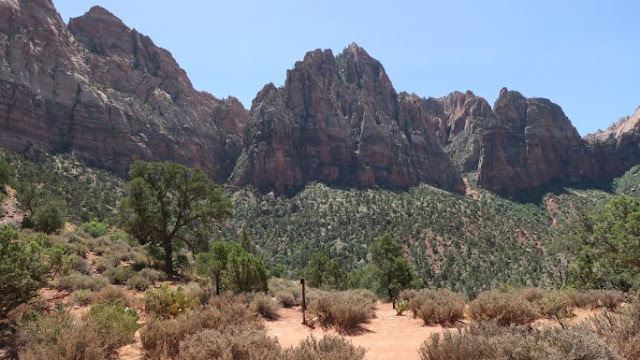 Click to continue reading about our visit to Zion National Park. At an elevation of 3000 feet, Zion is a beautiful national park with stunning scenery. This dessert terrain offers shear cliffs and deep canyons. The topography of the area has brilliant shades of red. You will be amazed by the beauty of the landscape. The south entrance of Zion National Park is located in Springdale, UT. Parking is limited in the national park. Plan to arrive by 7 AM if you want to take advantage of the free parking within the national park. If you do not get the free parking, you will have to park in Springdale and walk to the entrance. You will have to pay to park in Springdale. There is parking on the street at the metered parking or you can park in one of the paid parking lots along the main street in town. As you enter town looking for parking, drive all the way to the park entrance instead of taking the first open spot on the street that is available. The first parking spaces are located at least a mile from the entrance. Be prepared to pay $22 a day to park on the street. 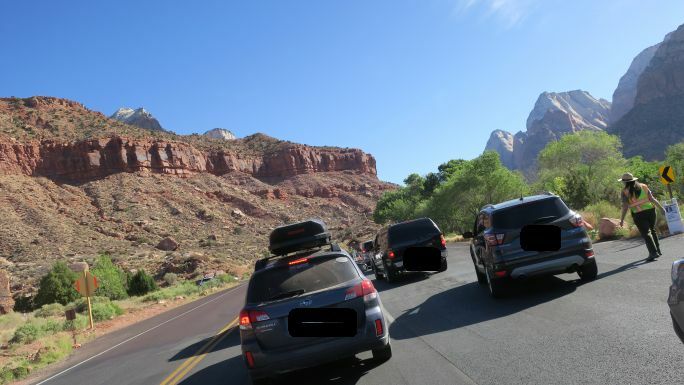 Entrance fees for Zion National Park as of June 2018 was $35 for a private vehicle for 7 days. If you plan to visit other national parks or national monuments, I highly recommend purchasing the America the Beautiful annual pass for $80. The pass is for 12 months from the date of purchase. With the pass you and everyone in your private vehicle receive free admission. There are other discounted passes available for military and senior citizens. To learn more check out the national park service annual passes website. 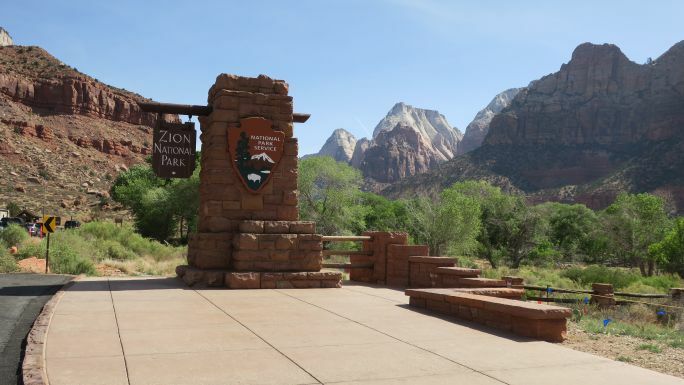 Zion National Park is one of the most visited parks in the U.S. - arrive early to avoid lines. 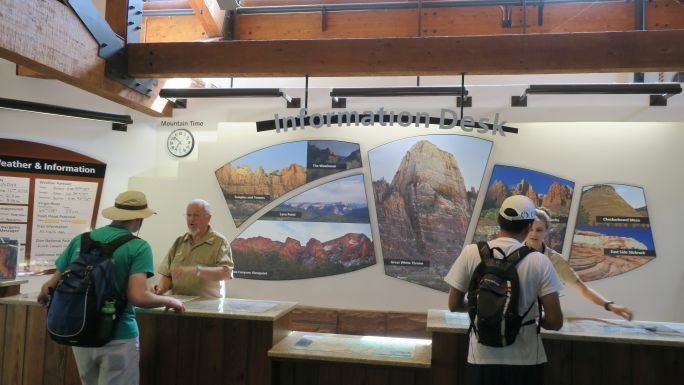 As you enter the park, take time to stop in at the visitor's center. Park rangers will help you choose the best way to spend your day. At the visitor's center you can also catch the FREE national park bus. In fact, the bus is the only way you will be able to get to certain parts of the park during peak travel season. Buses run every 7-10 minutes. The buses run on a hop on/hop off basis at 9 different stops throughout the park. If you ride the bus from the visitor's center to the Temple of Sinawava and back to the visitor's center it will take you about 1.5 hours round trip. This is a great way to see the park, if you are not able to hike. Come prepared,the buses do not have air conditioning. However, they do have excellent ventilation with the design of the bus. We really liked the bus system. Zion National Park offers a fantastic bus system - great for decreasing congestion in the park! 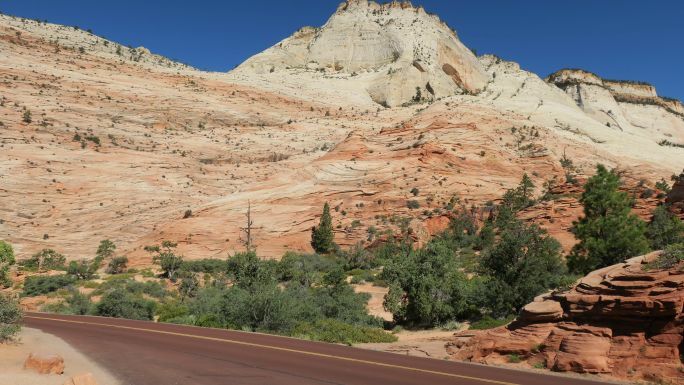 While the bus system will take you to part of Zion, you can also take a self guided tour on Highway 9 for some spectacular views. We only had 2 days to visit Zion National Park. There was no way we could hike every trail in that amount of time. After doing quite a bit of research ahead of time we selected 3 trails. 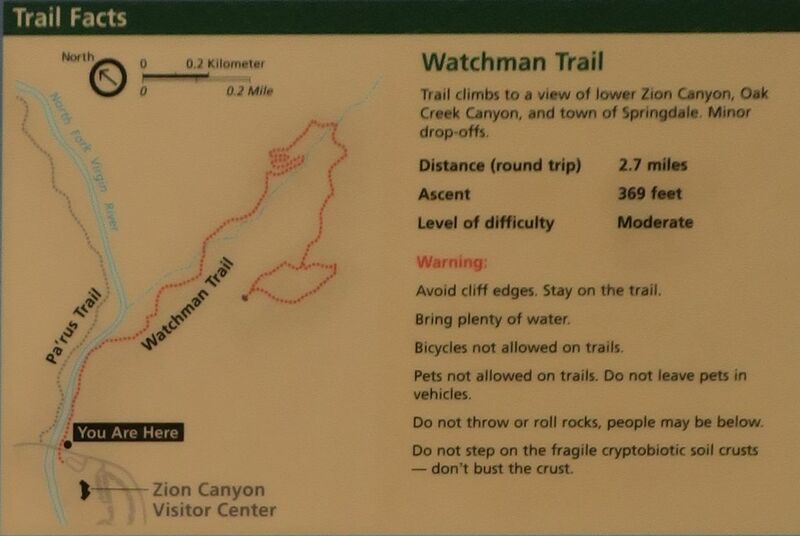 Watchman Trail 2.7 Miles Out and Back - The Watchman Trail is located near the visitor's center and has an elevation gain of only about 400 feet. I would consider the trail to be moderately easy. It is not a flip flop trail but it was not overly strenuous either. While you are not hiking up to the Watchman you have a great view of it. We made the mistake of starting this hike around 11 AM. It was early June but it was HOT!! If you plan to hike this trail, plan to start it early in the morning and bring lots of water. Once you reach the end of the trail, you have beautiful scenery to enjoy. I would say it was worth the hike up, just start earlier in the morning than we did if you are there during the summer. 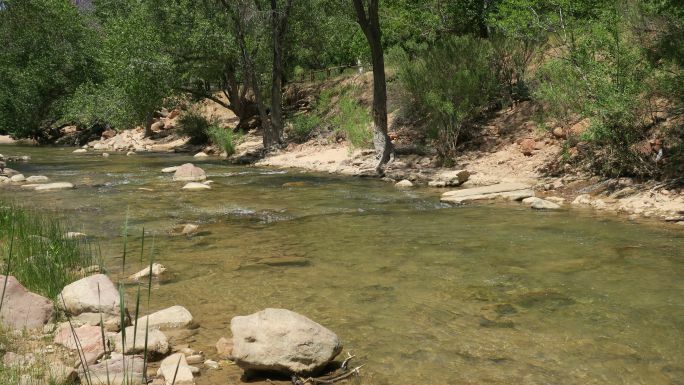 The beginning of the Watchman Trail has you hike alongside this refreshing stream. Emerald Pools Trail 2.9 Miles Out and Back - The Emerald Pools trail head is located near the Zion Lodge. 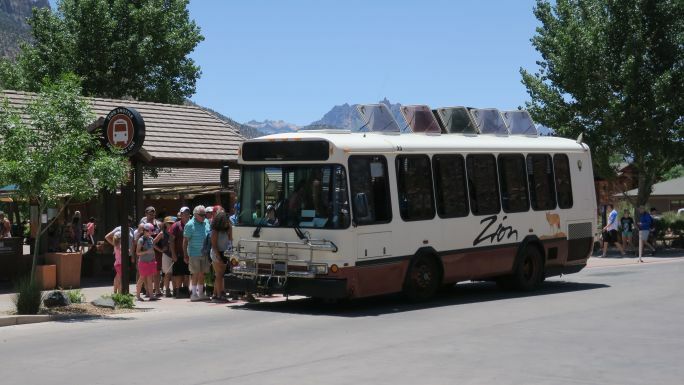 During peak travel season you will have to take the shuttle bus to Zion Lodge. From the lodge, cross the street to find the trail head. 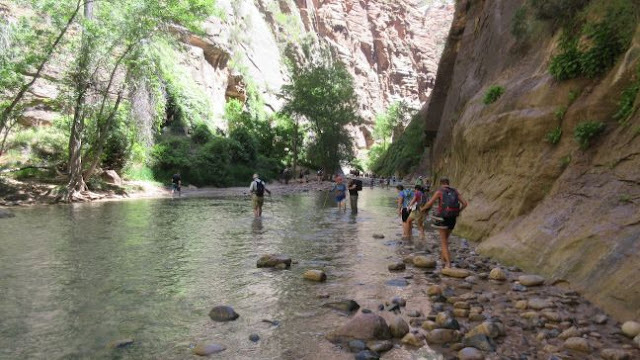 You cross the beautiful Virgin River on a concrete paved trail to the lower emerald pools. 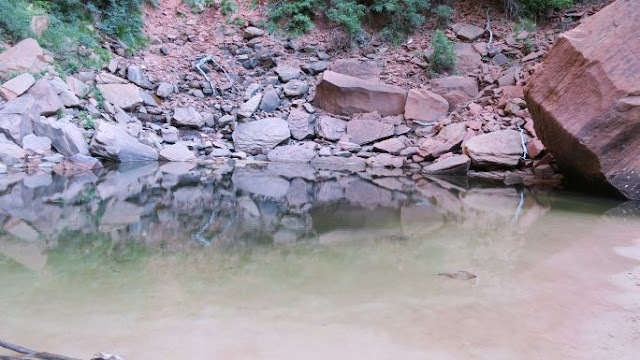 It will take you about 30 minutes to hike up to the lower emerald pool and back. Lower Emerald Pool... Notice the crowds and lack of a waterfall. If you choose to continue up to the upper emerald pool, you will not have a concrete paved trail. I would consider the hike up to upper emerald pool as a moderate trail. We hiked it in the afternoon and it was shaded, but still hot in early June. I don't know if it was because Zion had a dry year in the early part of 2018 or what, but the pools were unimpressive. The waterfall was nothing more than a trickle during our visit. The parts of the upper trail that was not in the shade were HOT!! Make sure to take plenty of water for your hike. 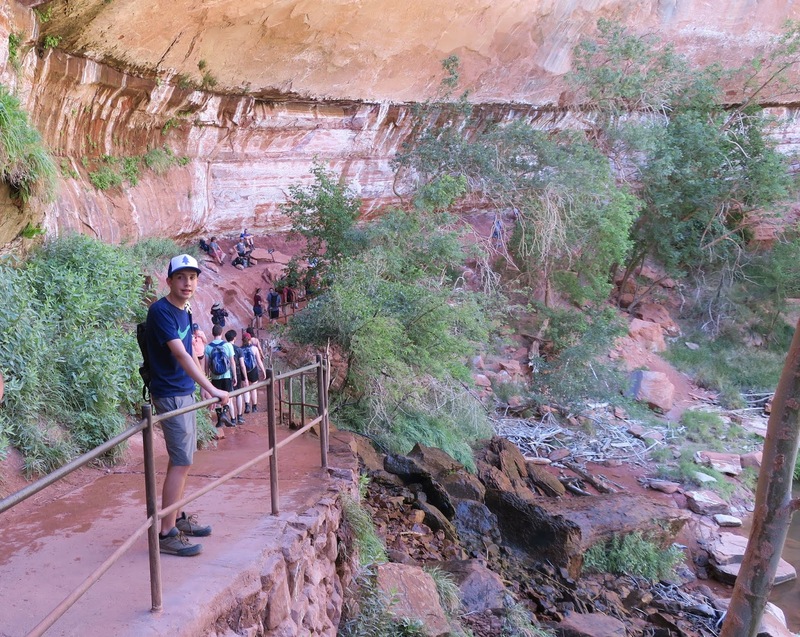 This is one of the most visited trails at Zion - it was PACKED! There was people every where! When we arrived at the upper pool, there were so many people, it looked more like Disneyland than a national park. The Upper Emerald Pool was a big disappointment. Based on my experience, I cannot recommend this trail. 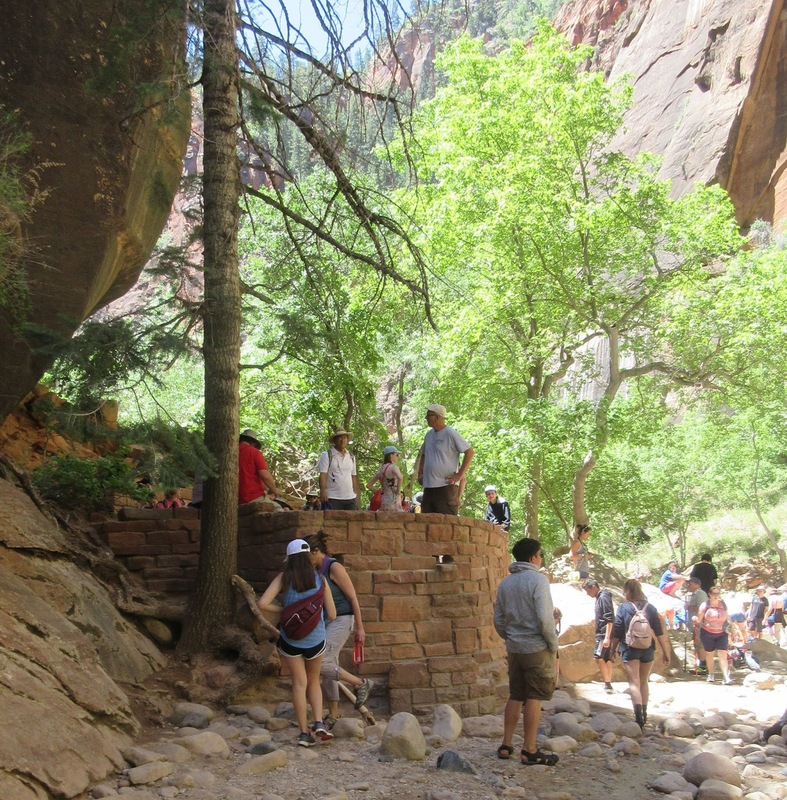 Update: As of July 2018, the Emerald Pools Upper trail is closed due to storm damage. Check Zion National Park website for updates on this trail. Zion National Park The Narrows is our family's favorite hike ever! The Narrows Trail Bottom Up - The Narrows were carved out by the Virgin River and is the narrowest part of Zion Canyon. The trail head starts at the Temple of Sinawava which is the last stop on the national park bus route. You will hike about 1/2 mile on a concrete paved trail from the bus stop to the river entrance. 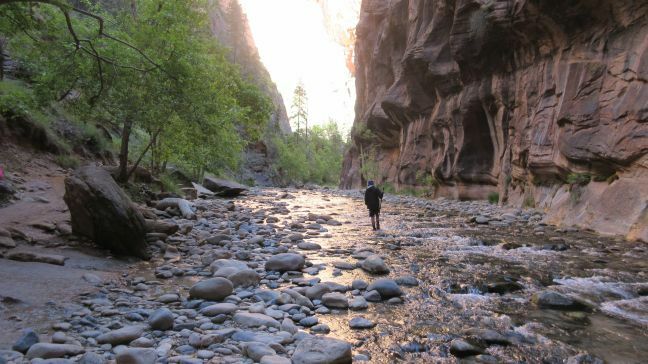 A hike in the Narrows can be as short or long as you want to make it. You hike until you decide to turn around and return to the bus stop. The hiking conditions in the early AM in June 2018 could best be described as a cold, slippery, awe inspiring hike! Of all the hikes we have taken over the years, the Narrows were by far, our favorite hike. 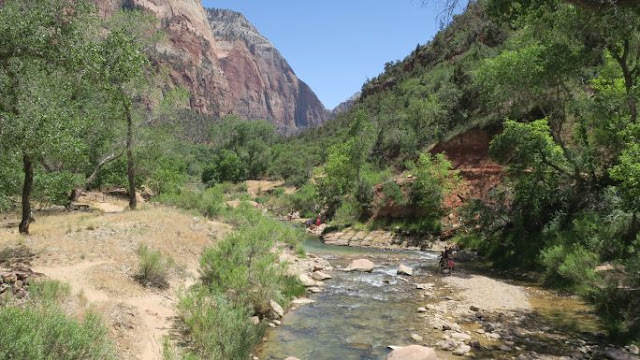 You spend much of your time hiking in the Virgin River. The river water level will depend on the time of year of your visit. While the water level was low when we visited there were still spots where we encountered rapids. It is not recommended that you hike the Narrows when a thunderstorm is possible due to flash flooding. Check with the ranger station for trail conditions before heading out. The time of year of your hike will determine what equipment and clothing you will need. For our early June hike we wore our bathing suits with a quick drying shirt and shorts over it. We also wore a rain jacket for added warmth. My husband did not have a rain jacket and he was colder than myself and my son. 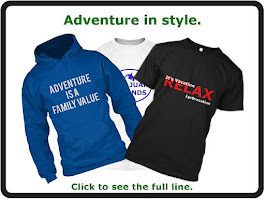 By the time we returned from our hike around noon my son and I were taking off our jackets because we were hot. 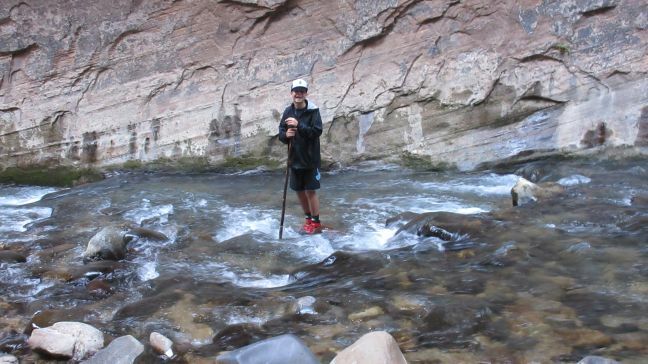 I highly recommend renting the boots & poles from Zion Outfitters to make your Narrows hike easier. After reading many reviews, we opted to rent the boots and poles for the hike. I rented them at Zion Outfitters located next to the entrance of Zion National Park in Springdale. Zion Outfitters allowed me to pick up my boots the afternoon prior to my rental date. This helped a lot because we hiked the Narrows at 6 AM the next day, before Zion Outfitter opened for the day. Zion Outfitters also offers wet suits for your Narrows hike as well. We did not need the wet suit in June. We highly recommend the Narrows hike. Just make sure you arrive early to avoid the crowds. When we finished our Narrows hike we found MANY people starting their hike... Glad we hiked at 6 AM instead of 11 AM! Lunch - We stopped at a Subway restaurant prior to heading out to Zion National Park and purchased sandwiches for a picnic. If you do not want a picnic lunch, there are several (non-chain) restaurant choices in Springdale. 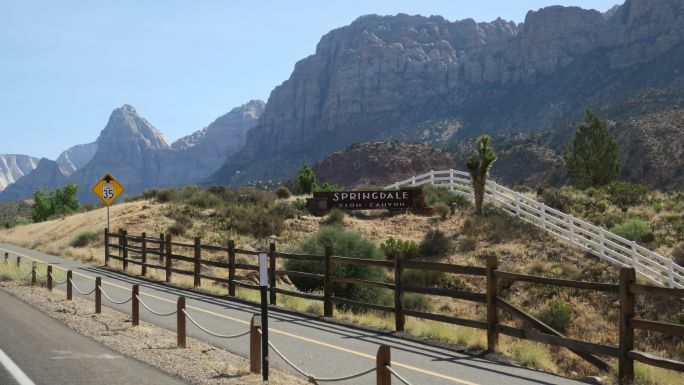 Lodging - We stayed in St. George, UT and commuted to Zion National Park. The highway is in good condition and the trip goes pretty quickly. See my previous blog post about our hotel in St. George, UT. If you have any questions or comments, please comment below. I hope this blog post helps you plan your next vacation on a budget.